Sri Kosuri received his B.S. in Bioengineering in 2001 from UC Berkeley, and his ScD in Biological Engineering in 2007 from MIT. He spent time in biotech startups before coming back to academia to do postdoctoral research at Harvard Medical School and the Wyss Institute. 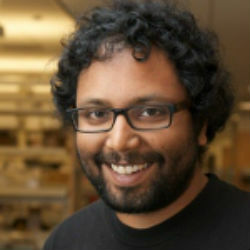 In 2014, he came to UCLA as an Assistant Professor in the Chemistry and Biochemistry Department. His lab’s research focuses on developing new technologies in reading, writing and editing DNA in order to better understand and engineer biology. In other words, the lab tries to build biological systems in order to understand them. The students (undergrads and grads) and scientists in the lab are currently trying to tackle a range of problems in synthetic biology, genetic engineering, biochemistry, genetics, neuroscience, and evolution.